Total War: Rome II went from being one of 2013's most promising games to one of its most disappointing. Indeed, it took months of patches and updates to even get it to a presentable state. Not that performance and AI were the last of the game's troubles. A fresh uproar has kicked off following a couple of recent developments. First there's some units popping up in paid DLC that were spotted in pre-release trailers for the game, despite claims from Creative Assembly that none of the main game's content was held back for release as DLC. Players are alleging that anyone speaking out about Creative Assembly on the forums about this - or continuing performance issues - is having their posts shifted to a "rants and raves" dumping ground. It's certainly correct to point out that units called Camel Cataphracts and Merc Naked Swords were used in a Let's Play walkthrough before launch. The naming is unfortunate, but these aren't the same units that were then released subsequently as DLC. As with all work in-progress content, it is subject to change and revision before the final game is shipped. Content might be revised for all sorts of reasons involving balancing or quality for example. The DLC we're looking at here are essentially a different version following increased design, artwork and balancing to match the quality of the other units available. The final selection of units supplied in the game were extensive and we felt they represented excellent value. I feel so...sad about all this. Of all the video game series out there, Total War may well be my favourite, as I've blown well over 1000 hours on them since Empire was released. 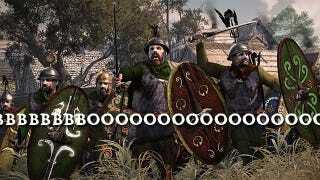 The series has had its incremental ups and downs in that time (I'm looking at you, Napoleon), but nothing like what's happened with Rome, which for all its ambition is also perhaps the most disappointing Total War game in the franchise's 14 year history. I kinda feel like instead of gnashing our teeth over Rome, we should just accept that it was in many ways a misstep, move on and hope their next game is an improvement.